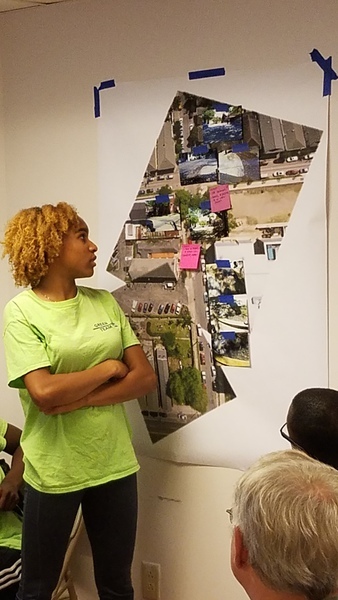 On May 6th, we met for the third in the Stormwater Workshop Series on "Designing a Stormwater Study." I had never hosted a workshop like this before, and wasn't entirely sure how it would work out, but things went really smoothly and when we all reflected on the event, things felt clear and on a good path. Everyone reflected that the two workshops we held before this, (the first where we held an introduction to Stormwater, discussed the issues, visited the sites and picked our study question, the second where we mapped out the sites and did ground surveys) set us up for success on this complicated step of the project, actually drafting a study design. 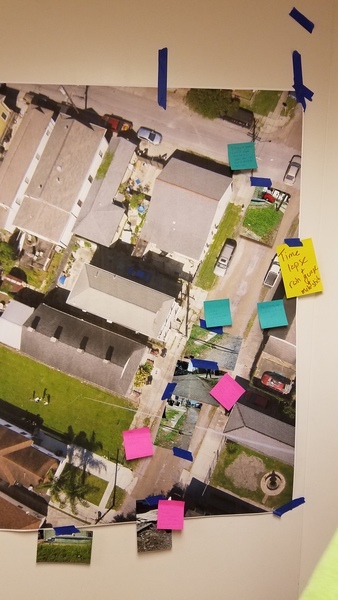 We started out this workshop by annotating the maps from the previous workshops. 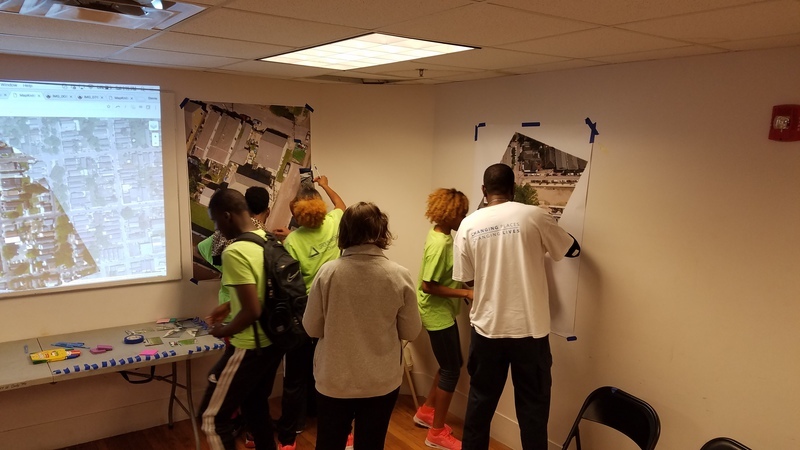 While not everyone has been able to come to all the events, there were enough people who had, that we were able to appoint a team leader for each site location to help fill in the gaps for those who hadn't been able to attend prior workshops. We then counted off into three groups, so that each group had a map to annotate. 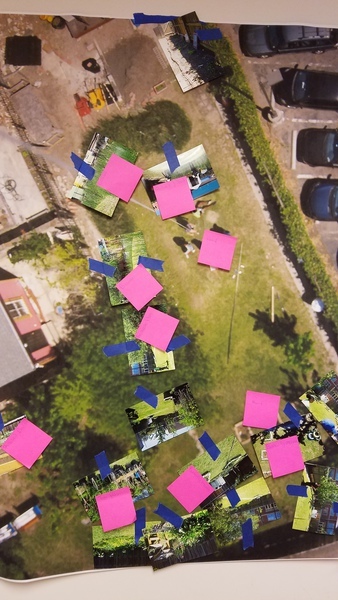 We used post-it notes and the ground photos taken during our site survey to document nuances about each site, for example, the map of the Earth Lab didn't show the elevated grassy knolls on the site, so we recorded information about those directly on the maps. 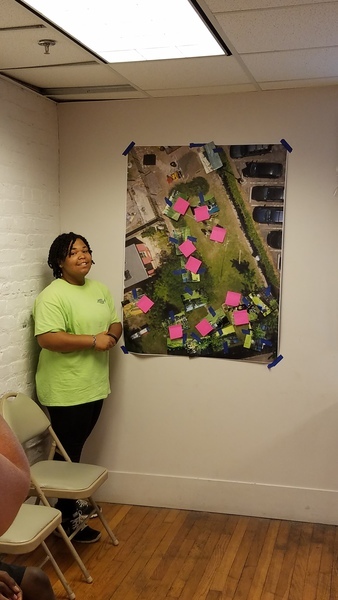 Once we finished annotating the maps, one person from each group presented the annotated map to the whole group so everyone had a clear idea about everything at each of the sites. In the regroup we all took our brainstorm ideas and put them on the board together. 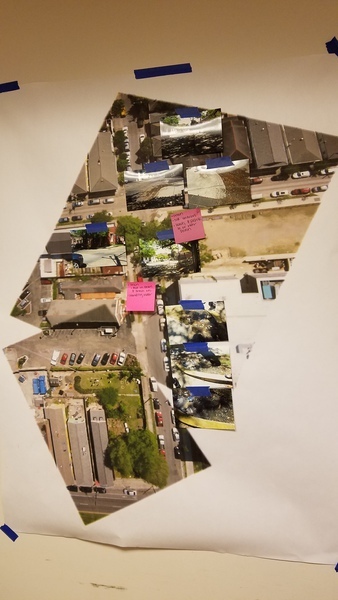 Those ideas included: google satellite images, guage boards, rain gauges, time lapse cameras, regular cameras, human observation, weather.com/.gov, post storm surveys, google street, rain barrels, and the plopper (tool to measure water height in stormwater tanks). From this brainstorm, we moved forward with proposals for which ideas would help us best answer our questions. Once we got into some discussion on it, we had some observations about our second question. First it requires a definition of the word "flood" and second, that if we have a good method for our first question, it could include the answer for our second question. We will set up a time lapse camera at each location that takes photos of the stormwater site. The camera will point towards a gauge board, and if we can, also a rain gauge. We will aim to survey each site every week during our month of data collection for ground photos, observations (such as if water at the site is creating a nuisance water collecting), and collecting samples if there is standing water at the site, documenting the samples location (we will test the samples for e-coli using testing kits we have). At each site we will also empty the rain gauges and at the Earth Lab, empty the rain barrel and check the height of the underground water tank. We will collect the photos from the time lapse at each site and date each ground survey back to the last rain event documenting the weather over the course of the month. We've collected a list of the materials we have and what we need to get this done. Looking forward to setting this up at the next workshop June 3rd 3-6!